The sunscreen we grew up with is damaging to the environment we play in AND damaging to our unsuspecting, slathered-up bods. There is much evidence exposing the average sunscreen is full of harmful ingredients; like active chemicals that contain potent endocrine disruptors, that in many cases can actually promote skin cancer growth and free radical production in the body. Typically, manufacturers create SPF in two different ways, by adding chemicals or by adding minerals. Chemical-based sunscreens work by adding chemical compounds ( Oxybenzone, oxtinoxate, and octisalate) to the sunscreen base to absorb ultraviolet light. These chemicals must be absorbed into the skin in order to be effective, which is why many sunscreens instruct you to apply them at least 20 minutes before sun exposure. Unfortunately, these chemicals have been found to mimic our hormones and disrupt our endocrine system, cause skin reactions, and produce cancer-causing free radicals. croll down for the 6 SCARIEST Sunscreen Ingredients & why to look out for them. Mineral-based sunscreens work by adding inorganic material that reflects, scatters, and absorbs UV light, such as zinc oxide and titanium oxide. These types of sunscreens sit on top of the skin, so can be applied at the time of sun exposure. The thing to be aware of with minerals, is particle size. If the particles are small enough to fit into your pores, they will be absorbed – and zinc oxide has been linked to organ damage if inhaled, ingested, or absorbed into the bloodstream. We use non-nano particle zinc oxide in this recipe. Some sunscreens have both chemical and minerals, so read your labels carefully to know exactly what you're getting. Better yet, make your own! Labels reading “healthy” and “natural” for both products and food, have little to no regulation over such claims and consumers should check ingredients. Whether you play in lakes or ocean, the sunscreen runs off your skin and disperses in the water. Studies show that oxybenzone, a common chemical found particularly in spray-on sunscreens, contributes to coral bleaching and leaves reefs deformed. Sunscreens add stress that erode coral resilience, meaning reefs are weakened and can’t bounce back from the global events, like bleaching or acidification. Oxybenzone is a common chemical found in all types of sunscreen, but particularly in the spray-on variety. Researchers have found this to harm coral in several ways. It has a similar effect on DNA to gasoline, and disrupts reproduction and growth, leaving young corals fatally deformed. It causes weird deformities in soft tissue and also causes the coral larvae to encase itself in its own skeleton, like a coffin. Even small doses of oxybenzone – about a drop in six-and-a-half Olympic swimming pools – damages coral. Researchers found concentrations 12 times that rate in popular waters off Hawaii and the US Virgin Islands. Hawaii lawmakers are proposing a ban on the use of such sunscreen on the islands. In the Caribbean, researchers noticed that bays popular with sunscreen-slathered tourists had dead and sterile coral, while those with little traffic were healthy. Oxybenzone has toxic effects on fish larvae and embryos. Best to avoid aerosol cans of sunscreen, because the spray mostly falls on to sand, where it gets washed into the sea or into sea turtle nests. Whilst Vitamin D is necessary to life and the feeling of beautiful sunshine kissing our skin is divine, the sun is strong! Especially in Australia. Look after yourself and do your best to avoid peak crisping hours, between 11 and 3 if possible. If you're outside in this strong sun ray phase, seek shade, wear a hat or skin covering clothes. Soz to be your mom, but skin cancer is real and shade is available. Plus, it makes you look heaps mysterious all tucked away in the shadows. Mix all ingredients except cacao and zinc oxide in a medium metal bowl. Create double boiler, by putting a medium saucepan with a couple inches of water onto medium heat and place the metal bowl in the pot. The bottom of the bowl should not reach the water, it should be suspended, the body of the bowl supported by the pot. Stir the ingredients occasionally in the bowl as they start to melt. When the mix is completely melted, turn off the heat and stir in the powders. Cover your mouth with a mask or your shirt as you work with the zinc to avoid inhaling the fine particles. The oils this mix contains are photosensitive, so keep your sunscreen out of the sun and store in cool places to avoid it melting. If it does melt, give it another stir and pop in fridge to quickly set. Apply liberally to exposed skin and reapply anytime water no longer beads on top. Adding more beeswax makes a thicker sunscreen, less wax makes a smoother sunscreen. The sun protection depends on the amount of each ingredient used, feel free to experiment with what works best for your skin. The zinc oxide creates a physical barrier. Be sure to buy zinc in bulk and only the non-nano particle, so that it cannot be absorbed into the skin. Be careful not to inhale the powder. The shelf life of this natural homemade sunscreen is about 6 months if you refrigerate when not using. 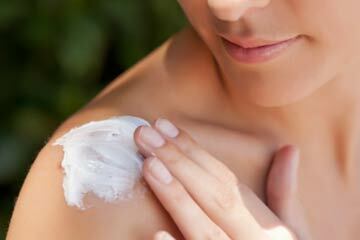 If you have natural lotions at home you can turn them into sunscreen by adding 2 tbsp of non-nano particle zinc oxide. Be sure the lotion doesn't contain citrus oils, as the citrus increases sun sensitivity. Check with your doctor or dermatologist before using any new products, especially if you have had skin issues in the past. Oxybenzone is a penetration enhancer (i.e., chemical that helps other chemicals penetrate the skin) undergoes a chemical reaction when exposed to UV rays. Can cause wide-spread skin allergies, most notably eczema-like allergic reaction spreading beyond exposed area, lasting long after out of the sun. Experts say Oxybenzone disrupts hormones (i.e., mimics, blocks, and alters hormone levels) which can throw off your endocrine system, most disturbingly mimics estrogen. According to the Centers for Disease Control and Prevention (CDC), 97 percent of Americans have this chemical circulating in our bodies, as it can accumulate more quickly than our bodies can get rid of it. Octinoxate One of the most common ingredients found in sunscreens with SPF, octinoxate is readily absorbed by our skin and helps other ingredients to be absorbed more readily. This chemical disrupts our hormones, mostly altering our estrogen levels and can be harmful for wildlife, too, should they come into contact with the chemical once it gets into water. Though SPF products are designed to protect skin from sun-induced aging, octinoxate may actually be a culprit for premature aging, as it produces menacing free radicals that can damage skin and cells. Retinyl Palmitate (Vitamin A Palmitate) Just like the vitamin A we eat, retinyl palmitate is an antioxidant. As an ingredient in sunscreen, it's function is to improve the product's performance against the aging effects of UV exposure, However, certain forms of vitamin A found in sun protection products—namely retinyl palmitate, a combination of retinol (vitamin A) and palmitic acid, an ingredient found in tropical plants such as palm and coconut—can be cause for concern. When exposed to the sun's UV rays, retinol compounds break down and produce destructive free radicals that are toxic to cells, damage DNA, and may lead to cancer. In fact, FDA studies have shown that retinyl palimitate may speed the development of malignant cells and skin tumors when applied to skin before sun exposure, so steer clear of skin sun products that harbor the stuff. Homosalate This UV-absorbing sunscreen ingredient helps sunscreen to penetrate your skin. Once the ingredient has been absorbed, homosalate accumulates in our bodies faster than we can get rid of it, becomes toxic and disrupts our hormones.